We’d love your help. Let us know what’s wrong with this preview of We Are Lost and Found by Helene Dunbar. Michael is content to live in the shadow of his best friends, James, an enigmatic teen performance artist who everyone wants and no one can have A poignant, heartbreaking, and uplifting, story in the tradition of The Perks of Being a Wallflower about three friends coming-of-age in the early 1980s as they struggle to forge their own paths in the face of fear of the unknown. Michael is content to live in the shadow of his best friends, James, an enigmatic teen performance artist who everyone wants and no one can have and Becky, who calls things as she sees them, while doing all she can to protect those she loves. His brother, Connor, has already been kicked out of the house for being gay and laying low seems to be his only chance to avoid the same fate. To ask other readers questions about We Are Lost and Found, please sign up. Helene Dunbar recalls the poignant early years of the AIDS crisis through the experiences of a compelling, diverse group of teenagers in early 1980s New York City. Fear, love, violence, longing, confusion and passion battle for primacy as Michael struggles with budding desire, a threatening father, a hostile world and a nascent plague. Cohorts Becky and James round out the cast of main characters, adding depth and feeling. Dunbar balances hope with risk and dread with possibility, deftly constru Helene Dunbar recalls the poignant early years of the AIDS crisis through the experiences of a compelling, diverse group of teenagers in early 1980s New York City. Fear, love, violence, longing, confusion and passion battle for primacy as Michael struggles with budding desire, a threatening father, a hostile world and a nascent plague. Cohorts Becky and James round out the cast of main characters, adding depth and feeling. Dunbar balances hope with risk and dread with possibility, deftly constructing a plot which buoys the story which, in less skilled hands, could be too depressing or unrealistically blithe. Her prose is beautiful and haunting, her characters affecting, true and skillfully crafted. I’m an #ownvoices reader; trust me: she nails it. Five stars is not enough. 3.75 💫 Important. Poignant. Maudlin. I got to read an early draft of this book from the author and it's now one of my favorites. I love it with all my heart and would have hugged it if I could. It's uplifting and empowering with an amazing ensemble cast of 1980's characters that you can't help but adore. Very eighties! A spectacular tapestry of imagery and emotion. Lyrical, poetic, joyful, exuberant, and un-put-downable. Me: *reads the title of the book* Sounds gay tell me more! Me: *reads the blurb* I WAS RIGHT. It sounds heartbreaking GIVE IT TO ME!! 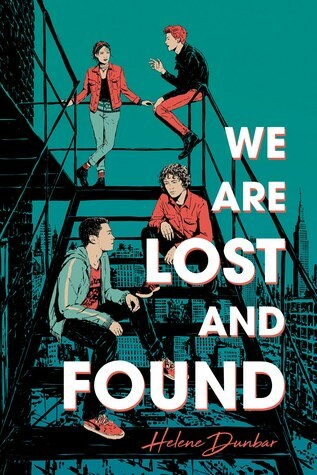 Now that WE ARE LOST AND FOUND has a cover and ARCs are going out, I wanted to share some things about the book. - It’s set in NYC - the city that feeds my soul - and this book is my homage to the grungy but invigorating face it wore in the early 80’s. - It’s FILLED with 80’s music. I ran my high school and college radio stations and my friends and I were always immersed in music. - Michael is very much who I’ve tried to be in my best moments: seeking, insightful, empathetic. - Becky is very much like teen me, including knowing she’s Jewish but not really being sure what that means, and loving her role as an editor on her high school paper. - James is very much like many of my incredibly talented friends: driven, experimental, creative. - It has two AMAZING afterwards by three AMAZING AIDS activists and you should read those even if you don't read my book. I hope you read my book (but seriously, make sure read the afterwards!). This book was so good that I wasn't even annoyed with the lack of quotation marks. Michael's story offers amazing insight of what it was like to be part of the LGBTQ community during the AIDS crisis. His story is heartbreaking but also hopeful, and I found it easy to get sucked into every single word of this book. Called the "queen of heartbreaking prose" by Paste Magazine, Helene Dunbar is the author of WE ARE LOST AND FOUND (Sourcebooks, September 2019), BOOMERANG (Sky Pony 2018), and PRELUDE FOR LOST SOULS (2020) as well as THESE GENTLE WOUNDS, and WHAT REMAINS. Over the years, she's worked as a drama critic, journalist, and marketing manager, and has written on topics as diverse as Irish music, court ca Called the "queen of heartbreaking prose" by Paste Magazine, Helene Dunbar is the author of WE ARE LOST AND FOUND (Sourcebooks, September 2019), BOOMERANG (Sky Pony 2018), and PRELUDE FOR LOST SOULS (2020) as well as THESE GENTLE WOUNDS, and WHAT REMAINS. Over the years, she's worked as a drama critic, journalist, and marketing manager, and has written on topics as diverse as Irish music, court cases, theater, and Native American Indian tribes. She lives in Nashville with her husband and daughter.